Chef Emeril Lagasse prepares his version of game-day favorites and introduces a few of his New Orleans-style dishes in this sports bar restaurant. Over 100 HDTV screens and one main projection screen capture the action of all major sports events. All types of betting services are offered and you can settle into the luxurious stadium seating to watch your favorite team. This is a race-book with an outstanding menu provided by avid football fan Lagasse. Although the food is fantastic, it is always secondary to most of the guests who are there for the sports book and TVs! Fridays are for oysters and beer throughout the summer so check out the specials offered. Named “Best Sports Lounge” by Vegas Seven, “Best Sports Bar” by Las Vegas Review-Journal and one of the “Top Sports Bars in Las Vegas” by Yahoo! Sports and one of the “10 Best Sports Bars Across the USA” by USA Today. Food is reasonably price but they charge a $50 minimum per person to sit inside. I am a sports fan but was very loud and some other patrons were obnoxious. Pass in the future. 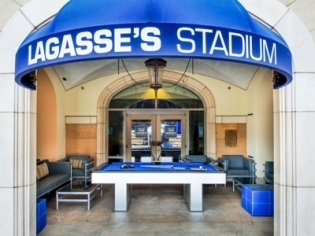 We loved Lagasse’s Stadium! It was a fun sports atmosphere with big screens.